Mini Musicals 2017 Season Announced! 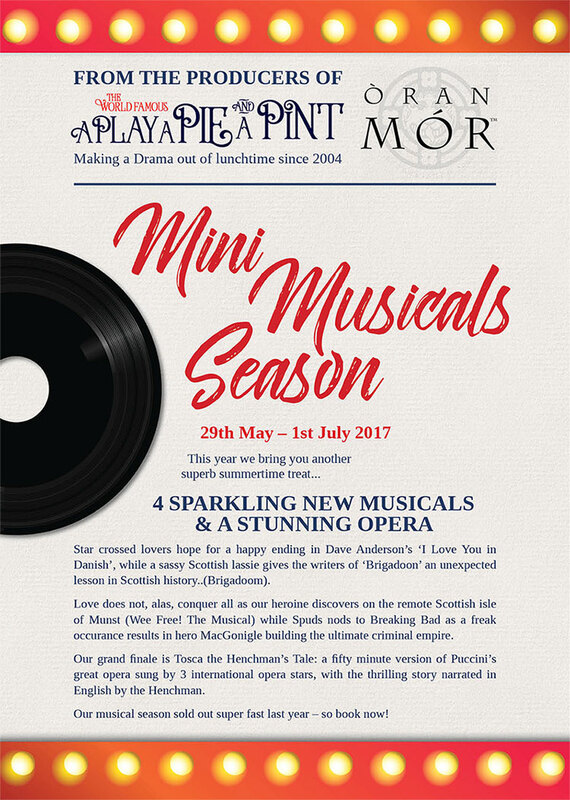 A Play, A Pie and A Pint is delighted to return this year with another season of Mini Musicals. 4 SPARKLING NEW MUSICALS AND A STUNNING OPERA. Star crossed lovers hope for a happy ending in Dave Anderson’s ‘I Love You in Danish’, while a sassy Scottish lassie gives the writers of ‘Brigadoon’ an unexpected lesson in Scottish history.. (Brigadoom). Love does not, alas, conquer all as our heroine discovers on the remote Scottish isle of Munst (Wee Free! The Musical) while Spuds nods to Breaking Bad as a freak occurance results in hero MacGonigle building the ultimate criminal empire. 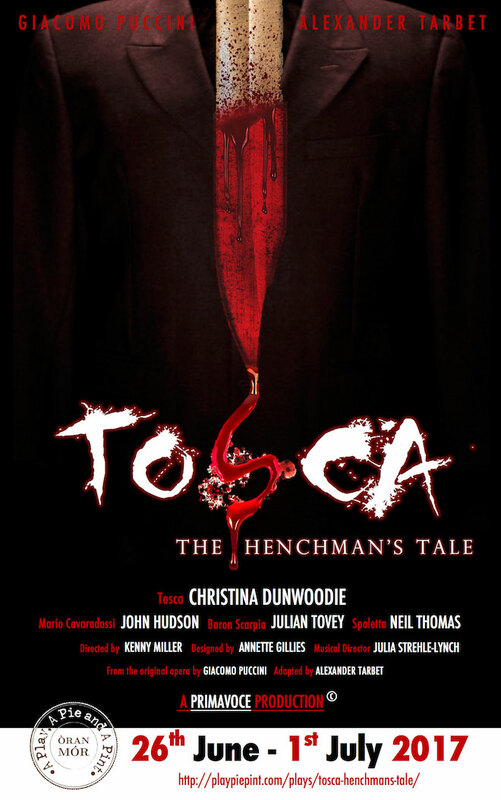 Our grand finale is Tosca: a trio of international opera stars perform the thrilling music from Puccini’s well loved opera, while a Henchman steps out of the shadows to tell a deadly tale of lust and murder. Our musical season sold out super fast last year – so book now! Alan Jay Lerner and Frederick ‘Fritz’ Loewe – neither of whom has ever been to Scotland – have just put the finishing touches to their musical ‘Brigadoon’. Now they are holding auditions for the leading role of Fiona and find out from one of the young hopefuls that there are some glaring historical errors in the script. This leads to a clash, a brief love affair and a rousing sing-song finale. And some very nice tunes along the way. When David MacGonigle’s wife dies, his perfect middle-class life collapses around him. But a freak occurrence, involving mouldy chips and Iron Brew, leads to his discovery of a new designer drug, Spuds. Soon he has built the ultimate criminal empire, but at what cost? A new musical comedy about grief, greed and grease. It’s opera, Giacomo, but not as we know it. All the way from the Met, Covent Garden and Milan to Oran Mor, a trio of international opera stars will perform the most thrilling music from Puccini’s most well-loved opera. Meanwhile, the Henchman steps out of the shadows to give us his fly-on-the-wall take on this tale of a deadly spiral of true love, sadistic lust and murder. All the dirty work for Rome’s top secret policeman, an arrogant demagogue and sexual predator, is carried out by the Henchman…so he knows where all the bodies are hidden and who has the negatives. Alexander Tarbet, author of international best-selling Amsterdam based detective novel, ‘Mokum’, has lived and worked in London, Amsterdam, and San Francisco. 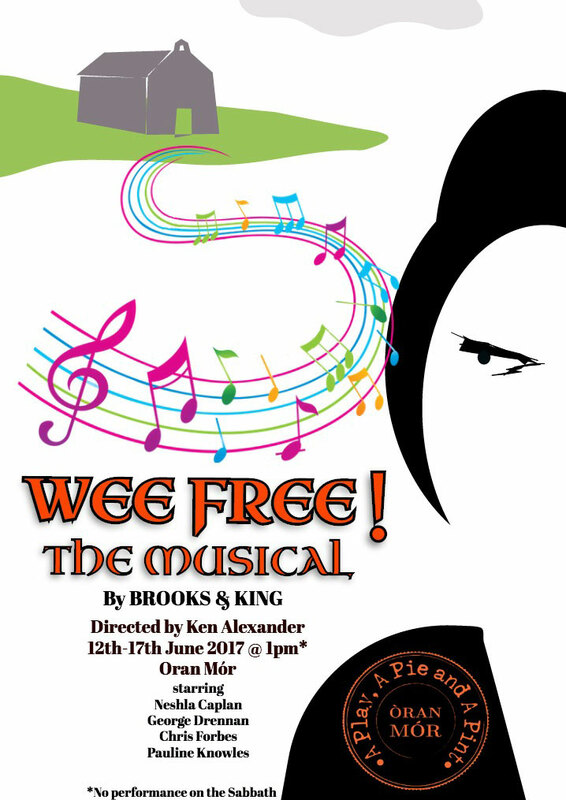 Tickets can be purchased through www.ticketweb.co.uk, 08444 771 000 (booking fee will apply) or from the Òran Mór box office on the day of the performance. The box office is located just inside the main front entrance on Byres Road and opens at 12noon (Monday at 12.30pm.) Tickets are sold on a first come, first served basis. Ticket price includes a drink (beer, wine, soft drink) plus a meat pie or vegetarian quiche.